Our precious Ivy Lynnae turned 2 yesterday, January 12. 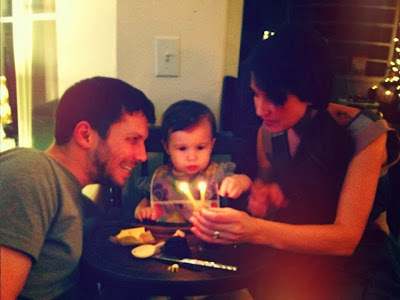 Two years old. 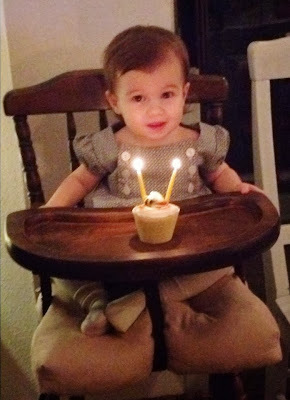 My second baby Girl is two years old! 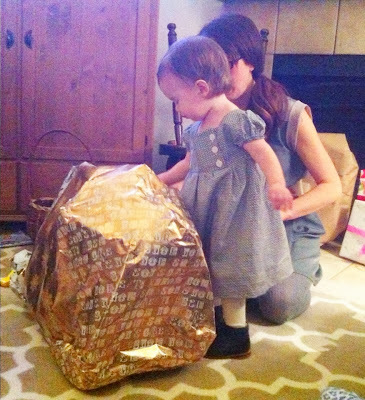 And, let me tell you - this little Girl is one amazing treasure. Mark and I are constantly in awe of her. There will often be a moment, almost once a day, where Mark and I will look at each other and silently shake our heads and smile in wonderment over how gentle, meticulous, careful, sharing, mindful, loving, affectionate, sensitive, and insightful she is. Sounds familiar, doesn't it? Food: Zucchini! (which she excitedly calls "keeny"), any fish, chicken sausage, bananas, and Grammy's apple sauce (which she calls "awesome sauce). 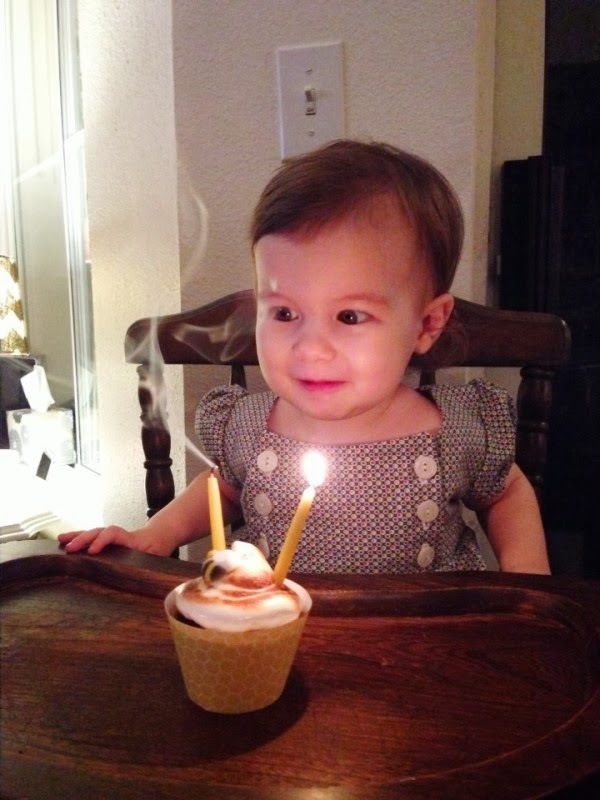 She's not very interested in sweets. She is an excellent eater and enjoys most vegetables. She is very well-fed. Toys: Her play kitchen. She cooks for us every single day. Her baby dolls. And a new Little People Bus she just got. Books: Biscuit (a series of stories about a little girl and her puppy). 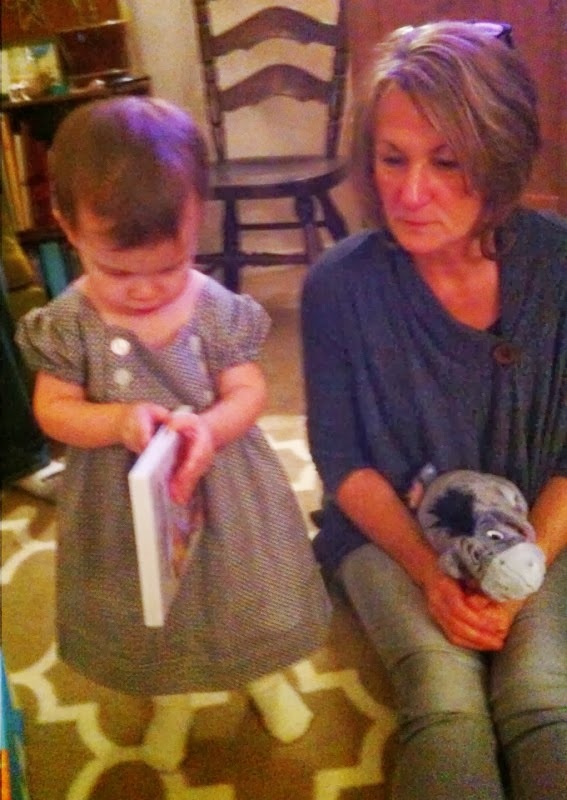 And, Beatrix Potter books - she can't sit still through reading them but loves the pictures and calls them all "guck guck dis" (which translates as "duck duck goose) because of the duck on the inside of the covers. Bedtime Lovey: her "baa-baa" - a teeny tiny plush white lamb. Clothes: a pair of one-piece footed zip up jammies in pale blue with little yellow ducks. They are the only jammies I have let her wear out to the store. She would wear these every day. Animals: Elephants (she calls them "elesants" because she pronounces "f" sounds as "s" sounds…try to keep track of that one!). Owls (called "hoo hoos"). Donkeys ("hee haws" - she loves Eeyore). And, doggies ("woof woofs"). Songs: "Wheels on the Bus", "If you're happy and you know it", "ABCs". Cute things she says and does: *Like I mentioned, she pronounces "f" as "s", which can be tricky when interpreting. She says "elesant!" and then lifts her chin and tries to make an elephant sound whenever she sees one. *When she leaves the room, she runs and looks over her shoulder and says "bye, see ya!" *She asks to hug and cuddle a lot (oh melt my heart) = she says "cu-yo" and cradles her arms like she's holding a baby and swings back and forth. *When she gets very excited and is trying to tell me all about something, she starts to play with her hair with both hands. 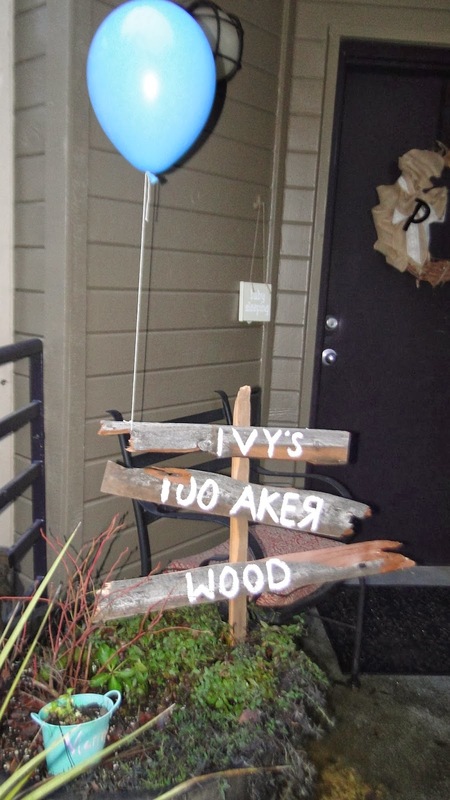 *Ivy LOVES stars. 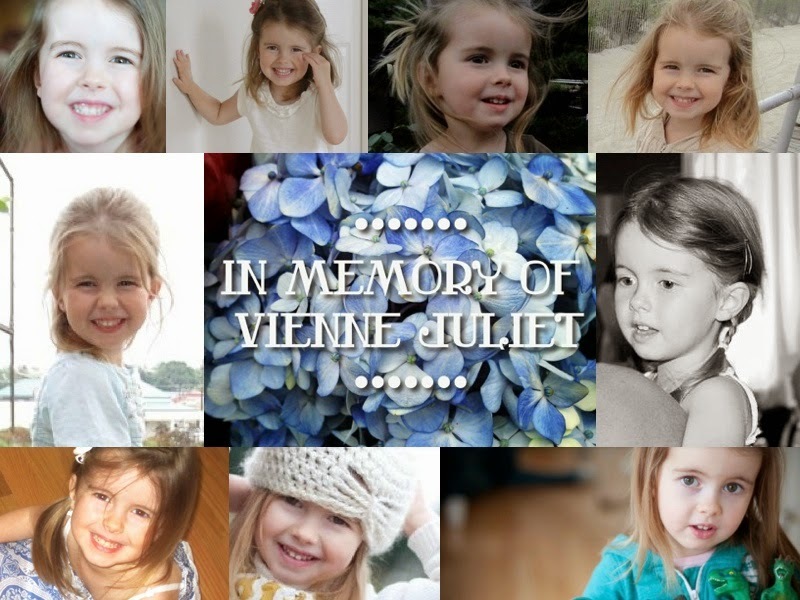 Yes, it is because we have Vienne's star in many places. Because both Mark and I have a tattoo of Vienne's star on our forearms, Ivy requests that we draw a star on her hand every few days. Once it's worn off, she will ask for a fresh new drawing on each hand. It's pretty cute. I have no problem with her getting a tattoo of her sister's star when she's of age. *She is very in tune to emotions when she is watching a show. She will point and say "Pooh sad" in a very sad voice and seem like she is all worried. She does not like it when any character is sad. *She is a major perfectionist….major. She has to push drawers in all the way…she will fix the drawers I left partly open in the kitchen. When cleaning up (which she's not always in to), she will make sure that every last piece is picked up and put away. 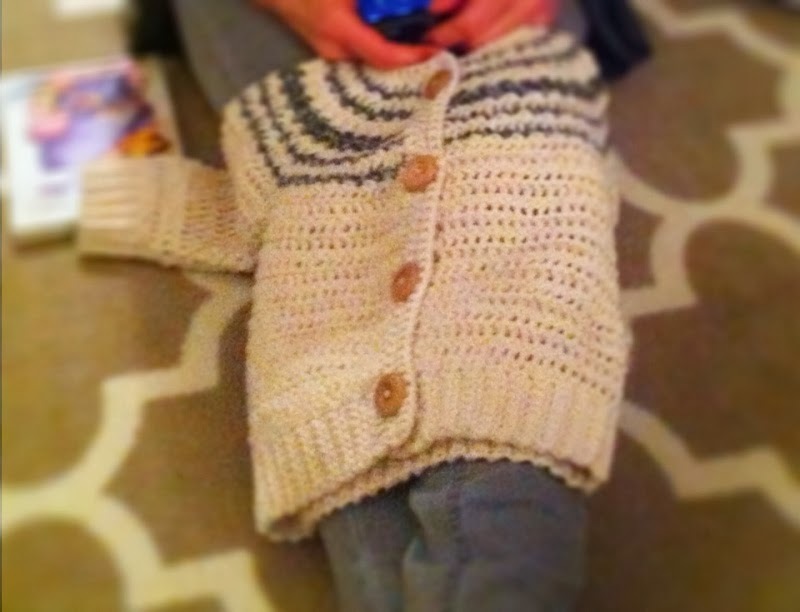 All buttons must be buttoned on her cardigans. *She has a weird thing with her feet - she hates them being touched and insists on wearing socks all the time. When we change her clothes she is emphatic about putting the socks on first. *She loves to play with water. I will give her a cup half full of water and an empty bowl and she will pour the water back and forth between the two. She is pretty accurate and meticulous about it. She takes care of her spills by running to get a towel. 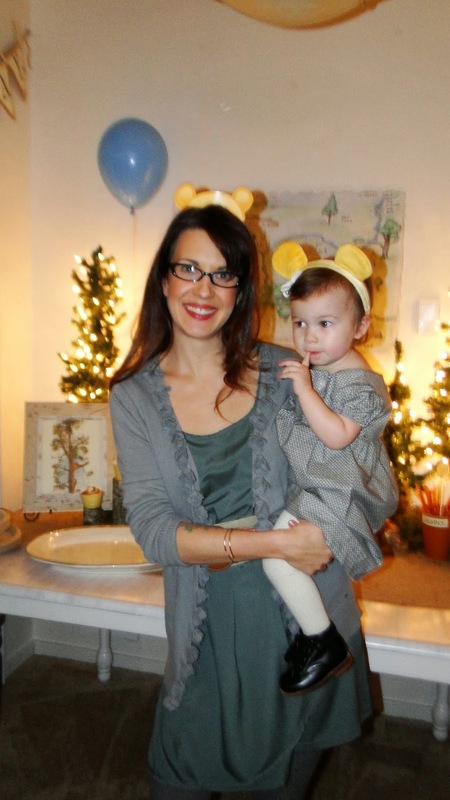 For this birthday, I jumped in with both feet and threw her a fun Classic Pooh themed party. I love to craft and create (as you've probably seen in posts about Vienne's birthday parties) and so I was excited to get back into it, this year for Ivy. 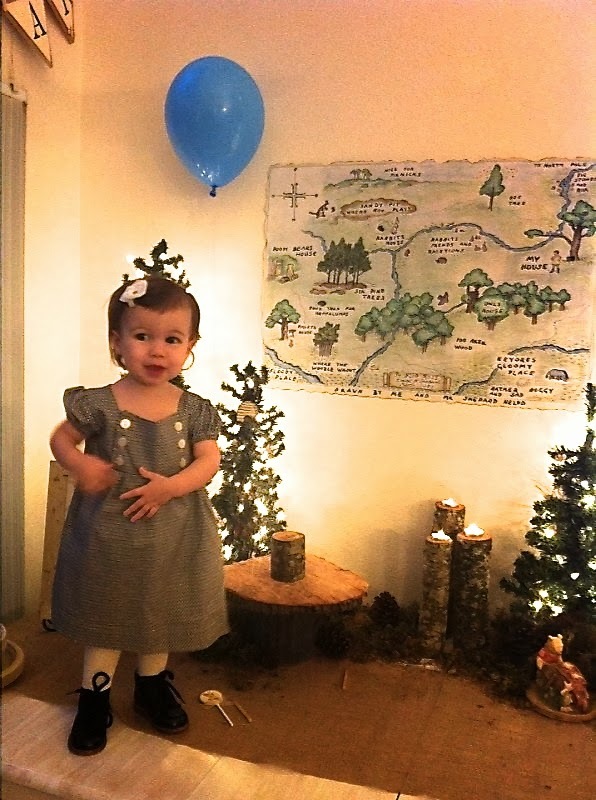 The planning of the party is what is fun for me…all the creative details…but actually doing the party, now that's another story. Very difficult on my nerves right now. But, it is worth it for my girl. Everyone had a wonderful time. 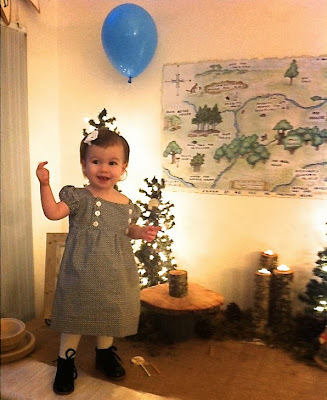 It was a lovely little party and I believe our Baby Girl enjoyed herself. 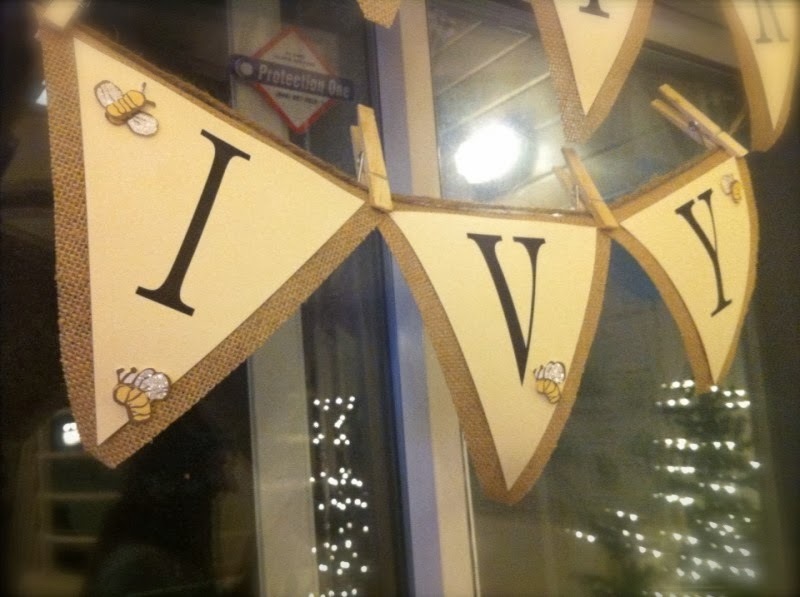 burlap bunting banner with sparkly little honey bees and a star in the middle because Ivy loves stars. The spread. I wish the photo was better. This was the best we got. I colored the map of the 100 Aker Wood that I had printed at Staples. Used twinkle lit trees from my and my mom's Christmas decor and stuck more sparkly little honey bees all over the tree branches. Printed and framed some simple Classic Pooh images from the internet. Found a cute porcelain Pooh figurine at Goodwill. "Hunny" labels for simple clay pots. Moss and pine cones. And, scored some pieces of wood and logs with tea light holes from my sister in law, who just threw her girlfriend a Pooh Baby shower. Oh, and of course, the classic one blue balloon. 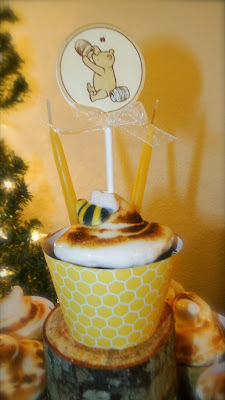 "Hunny" pots filled with honey sticks and homemade honey marshmallows, dusted in cocoa powder. I stuck the marshmallows on candy sticks and wrapped them in little cellophane bags. The beehive cupcakes. I tried my best at these. I found an image on Pinterest that I was trying to copy. Cut and made the honeycomb printed wrappers. Grain free chocolate cupcakes with homemade toasted honey marshmallow cream topping. The toasted marshmallow topping was supposed to look swirled like a beehive…but the kitchen torch kinda melted the swirling. And, they were each topped with a sugared honey bee - which were the only things on the entire cupcake that was sugar - everything else was made with honey. 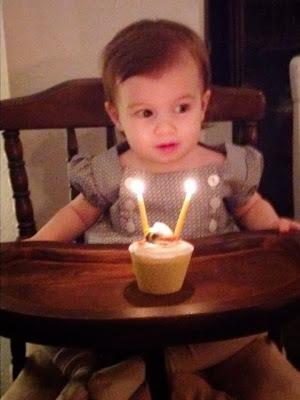 Ivy's cupcake with two hand-dipped bees wax candles. Mark torching the marshmallow cream. 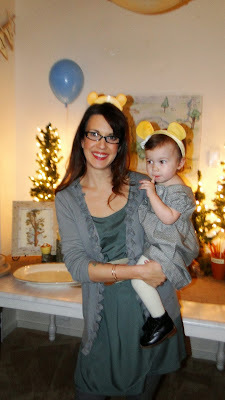 Pooh bear ears for everyone. My little Birthday girl! Isn't her dress darling? 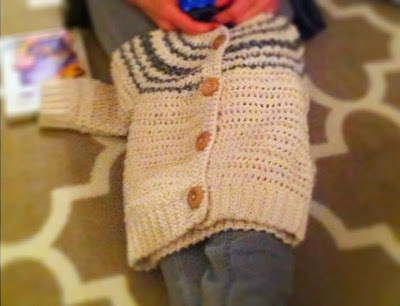 It was handmade for her by a sweet friend of ours. This was the perfect occasion to wear it with her vintage black granny boots. The drink station with coffee, tea, and homemade honey-mint lemonade. Phew I went through a LOT of honey! For dinner, we served Ivy's favorite meal - fresh caught salmon (caught by her Grandpa Tom), roasted zucchini and carrots, and herbed brown rice. It was simple, easy, yet delish. 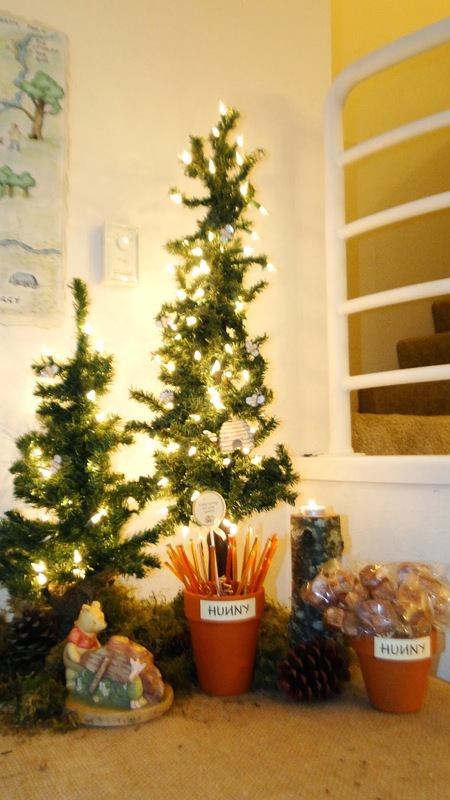 Utensils, napkins, and birch tree straws. Kids' tables with easy mess-free crafts. sticker scenes and paper dolls. Owl's Tree Howse sign, leading up to the fort in our loft. At the top of the stairs, you have to crawl through the entrance to the "tree house" fort. 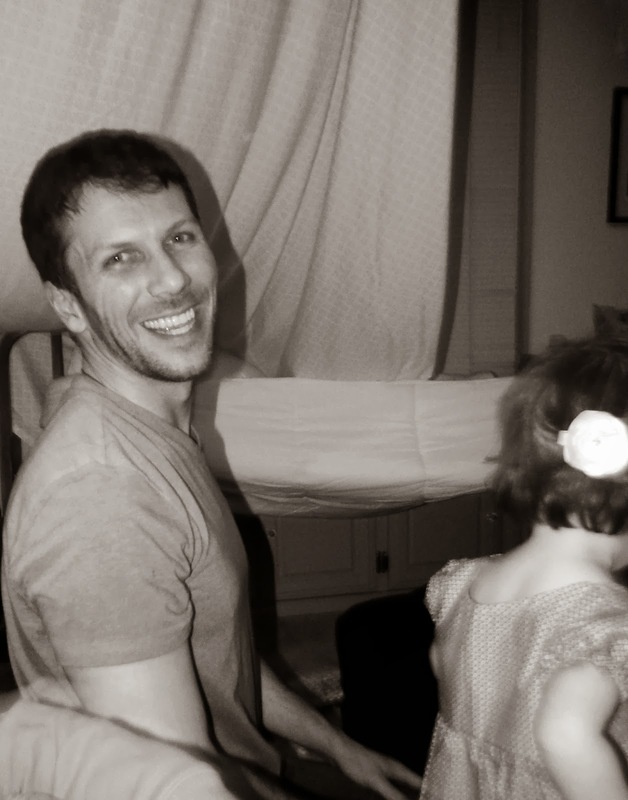 Inside, sheets were hung and draped about and mattresses on the floor for jumping. It was a major hit. 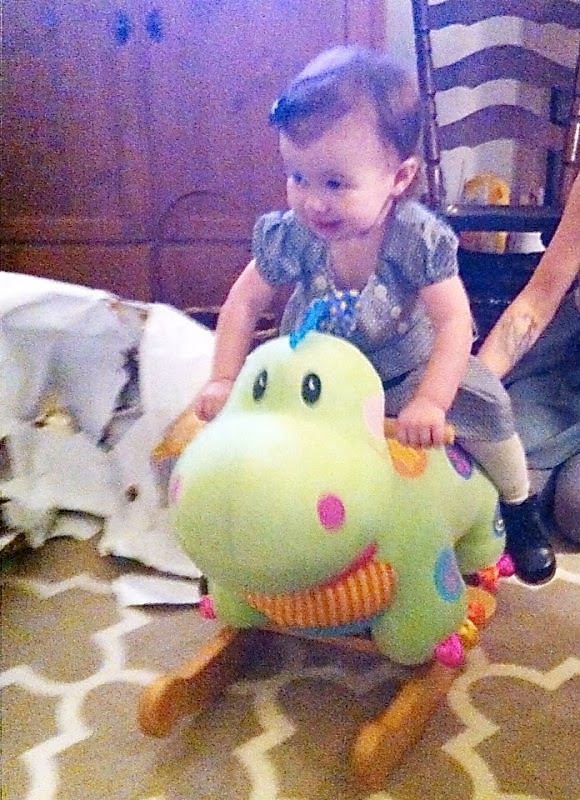 well…it's a dino rocker, of course! 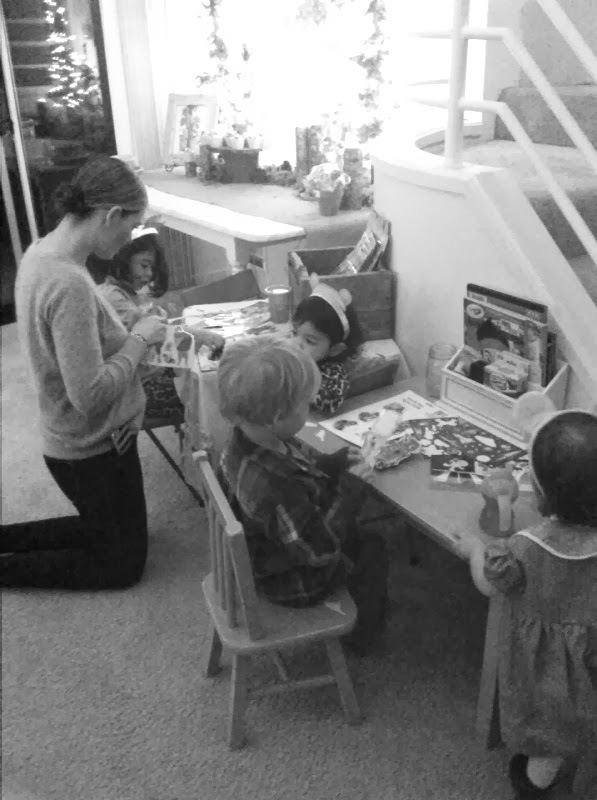 From Uncle David, Auntie Kinsey, and Cousins Elliott and Charlie. 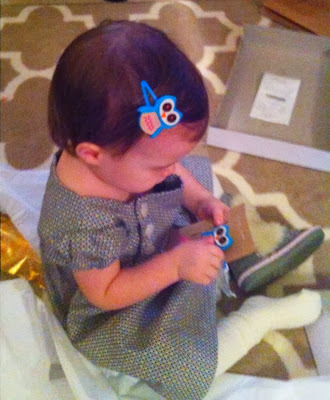 She LOVED the owl clips that went with a darling outfit, from Uncle Jeff, Auntie Eileen, and cousins Ella and Faith. She Also loved the awesome nordic Naartje boots she is wearing on one foot from Uncle Setth, Auntie Lacey, & cousins Caleb and Kai. I made her a sweater. Cross-eyed wonder!! haha. 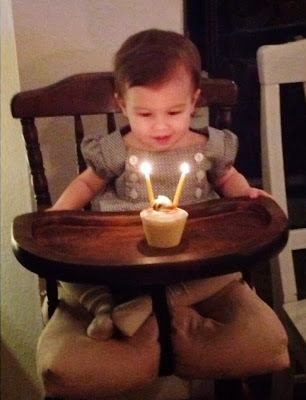 She LOVED the song and blowing out candles and asked for it over and over. We sang and relit a few times. HAPPY BIRTHDAY MY PRECIOUS BABY GIRL. I LOVE YOU MORE THAN YOU COULD EVER EVER KNOW. YOU ARE MY HEART AND MY EVERY BREATH…YOU AND YOUR SISTER. You certainly do make beautiful babies:) Happy Birthday to your precious Ivy, I'm sure big sister Vienne was smiling down on her! How I loved this birthday party for our sweet, gentle, loving Ivy girl. You did an amazing job, my daughter…amazing. Ivy is truly a precious gem, beautiful and unique…yet she reminds me so of Vienne. That, in itself, is such a treasure.